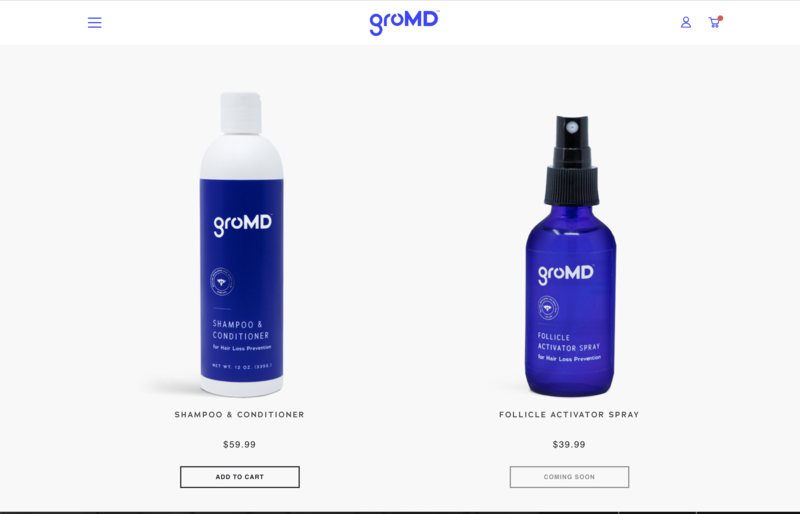 Doctor Developed launches new GroMD Hair Loss Shampoo & Activator Spray: “Your Daily Hair Care Routine Starts Here"
GroMD Hair Loss Shampoo and Activator Spray is a powerful treatment for men and women experiencing hair loss. Dr. Amir Yazdan M.D. is revolutionizing the hair care industry by offering high-performing hair care products designed to revitalize, regenerate, and regrow men and women’s hair. GroMD offers a simple and effective daily regimen to combat the biggest detriment to men and women’s confidence: hair loss. At GroMD, we understand hair like no one else. The name says it all. The GroMD hair loss shampoo is a powerful treatment and consumers using it have reported for achieving visibly thicker, fuller hair and stopping further hair loss. Dr. Yazdan is revolutionizing the hair care industry by offering high-performing hair care products designed to revitalize, regenerate, and regrow men and women’s hair. The brand is launching with two anti-hair loss treatments, including a unique DHT-blocking Shampoo + Conditioner and a highly concentrated Follicle Activator Spray. Unlike other hair loss shampoos and hair thickening products that temporarily plump hair from the outside, GroMD Shampoo + Conditioner and Follicle Activator Spray deeply penetrate the scalp to reactivate thinning hair follicles, creating an optimal environment for strand survival. Dr. Yazdan spent three years sourcing science-based ingredients, herbs, and specific DHT blockers to use in GroMD’s proprietary formulas. GroMD’s Follicle Activator Spray is a topical treatment that absorbs deep into the scalp, generating long-lasting results. A special blend of Vitamin A derivative helps clean out the follicles, which increases the absorption of Minoxidil (also known as Rogaine) for consumers already utilizing its perks. The Activator Spray comes in a no-mess spray bottle to stimulate the follicles directly at the source: your scalp. We recommend using with GroMD Shampoo + Conditioner for superior results. To help you sift through the many myths about hair loss circulating on the internet, the GroMD website includes educational materials to help you understand the science-based ingredients that are clinically proven to work for hair loss and regrowth. Find out the truth of what works—and what doesn’t. These two products were thoughtfully designed to fit easily into your daily wellness regimen. 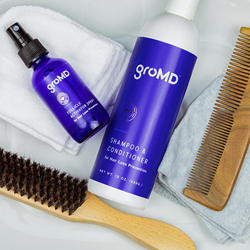 No excuses – feed your scalp for gloriously thick and full strands from root to tip with GroMD!